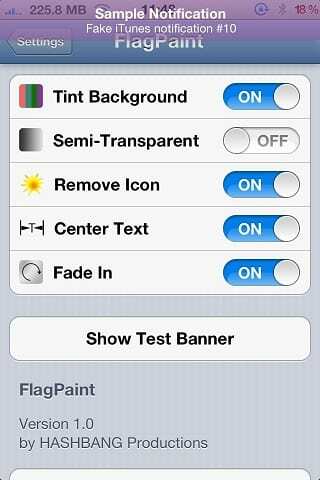 FlagPaint is a new Cydia tweak to change and customize the notifications in iOS strips. With this modification you can assign any color to the notification, make it a bit transparent, remove the small application icon that appears on each notification, you can center text rather than be left-aligned and you can add an effect notification to appear slowly rather than from the top down. Finally has a button to test the notification directly from the Settings app. You can download it for $ 0.99 in Cydia, you'll find it in the BigBoss repo. You need to have done the jailbreak on your device. Article FlagPaint: color notifications (Cydia) was originally published in News iPhone .